No, it wasn't that his visa had run out, nor was he trying get home in time for Brexit (as far as we know). A British national has been foiled by police and Border Force officers while trying to flee Australia on a jetski. No, this isn’t from the Betoota Advocate and it’s not April fools just yet. And no, it wasn’t that his visa had run out (as far as we know), nor was he trying get home in time for Brexit (as far as we know). According to Australian police the 57-year-old man was doing a runner, wanted in relation to drugs offences charges. 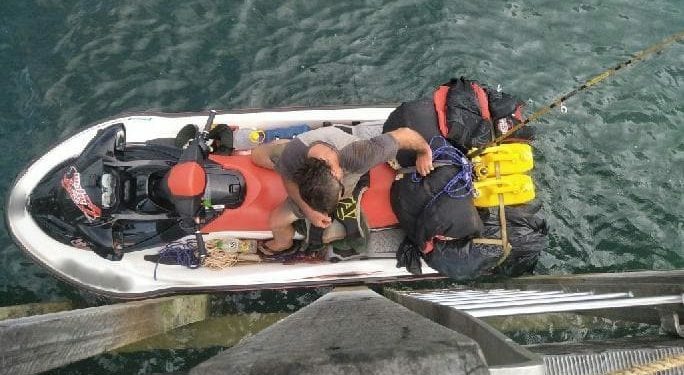 He was apprehended while attempting to cross from mainland Down Under, via the Torres Strait Islands to Papua New Guinea on nothing but a well kitted out jetski, armed with a fishing rod and a crossbow. And he nearly made it! Three Australian security agencies, the Australian Federal Police, Queensland Police, and Australian Border Force, were on his case after he was spotted launching the jetski, apparently loaded with plenty of extra fuel, from Pundsand Bay in far north Queensland’s Cape York for the 140 kilometer tropical dash. According to reports, the alleged fugitive was tracked by Border Force officers with the help of locals who reported his progress as he sped his way through the islands of the Torres Strait. He was eventually caught and arrested on Saibai Island just four kilometers from PNG and possible freedom. “He gave it a red-hot go,” said Queensland police’s Jock O’Keeffe, according to The Guardian. “Anyone who thinks they can either enter or leave Australia through the region without detection should think again,” the ironically named Border Force Commander Jo Crooks said, according to SBS. TOP IMAGE: The 57-year-old British man apprehended by Australian security agencies doing a runner from Australia on a jetski. (Supplied by Australian Federal Police).